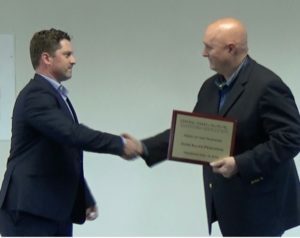 Jordan Cunningham, (Past) President of the Central Coast Taxpayers Association (CCTA), presents John Peschong, long standing resident of San Luis Obispo County, with the 2016 CCTA Hero of the Taxpayer Award. 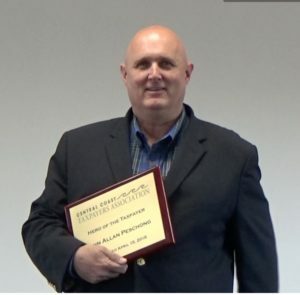 Peschong was recognized for co-founding CCTA many years ago, for serving as a past president and for fighting for the taxpayer against increasing taxes, in particular defending Proposition 13. He has been also recognized for his work by the Howard Jarvis Taxpayers Association. Supervisor Debbie Arnold received the first annual CCTA Hero of the Taxpayer Award in 2015 for her staunch support of Proposition 13.